Many of us are familiar with spiritual gifts and their use within the church or body of believers, but have you ever thought about those same gifts being used in nursing? This is what the brief article in Journal of Christian Nursing entitled Spiritual Gifts in Nursing is about. Our spiritual gifts are unique ways the Lord has gifted us as individuals and as a body to enrich the community, national and global church. The article “Investing in the Divine Economy” by Hardy reminds us to look at our career or vocation as an extension of our talents and gifts found through Christ. As Christian nurses we can impact nursing in immeasurable ways by merging our nursing knowledge with our spiritual gifts and talents. I would encourage new nurses and/or those nurses in career transition to spend time seeking the Lord in what he would have you do with your gifts and talents. As our Creator he has uniquely designed you and knows the plans he has for you (Psalm 139). Spend time with Jesus, in his word and discover the real YOU. Baylor University prints “Christian Reflection Project” with FREE in-depth discussion on various topics. 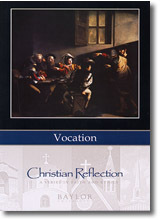 The link takes you to the issue on VOCATION.